It’s fall, and here in the U.S., that means pumpkin-flavored EVERYTHING. Seriously, Trader Joe’s October Fearless Flyer is about 90% pumpkin stuff. 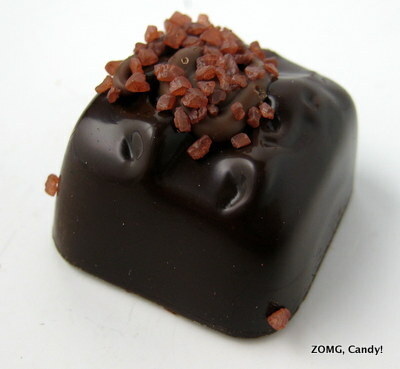 One of their seasonal pumpkin products includes these Dark Chocolate Pumpkin Spice Salted Caramels. The box described the caramels as “dark chocolate with a smooth pumpkin spiced caramel filling sprinkled with real Hawaiian sea salt.” Each shiny dark chocolate square was covered with a little squiggle of milk chocolate, then topped with a generous sprinkle of rust-colored sea salt. 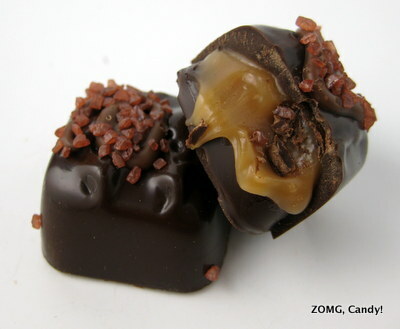 That dark chocolate shell shattered as soon as I bit into the caramel, revealing a limpid viscous caramel center. The chocolate had a thick melt and lots of caramel notes. The smooth caramel looked liquid but didn’t quite flow. It had a slight grain to the texture and a strong pumpkin spice flavor that was nutmeg dominant. Though the caramel was sweet, it was nicely countered by the saltiness of the crystals it was topped with. These were tasty, but I don’t think they needed the extra pumpkin spice hit. 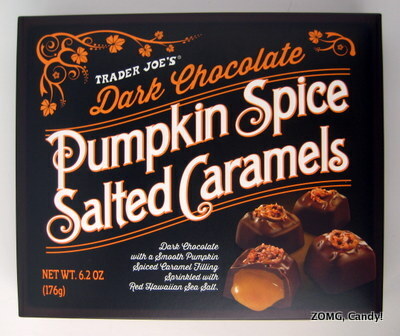 If you’re a pumpkin spice fiend, however, you’ll love these. An OM. Scandinavian Swimmers: Better Than Swedish Fish?